This popular berry – commonly called a “Wolfberry” – grows on a shrub native to China. The fruit itself is an elliptically-shaped orange-red berry one to two centimeters in length. Most commercially-produced gojis are grown on plantations in north-central and western China, in the Ningxia and Xinjiang provinces. 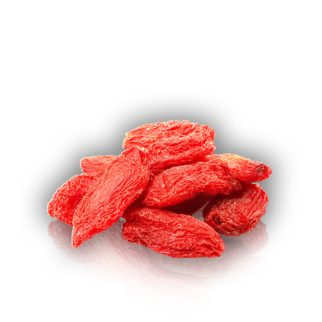 Our Goji berries are picked at the peak of the harvest, washed, and sun dried. We then reclean the dehydrated berries at our facility in Dalian, China (where we also process pine nuts and pepitas). Goji berries have been used in China for medicinal purposes for thousands of years. They are referred to as a “superfood”, known for a plethora of health benefits ranging from their anti-aging properties and high amino acid content (they contain 18 amino acids and all 8 essential amino acids) to their high protein content and abundance of phytonutrients that help protect skin and eye health. They are also known for their ability to reduce blood glucose,regulate cholesterol levels, and keep triglycerides at an ideal balance which is believed to aid inthe prevention of heart disease. Goji berries are a chewy tangy snack, added to various mixes, granolas, cereals, snack bars and smoothies for a nutritional boost.